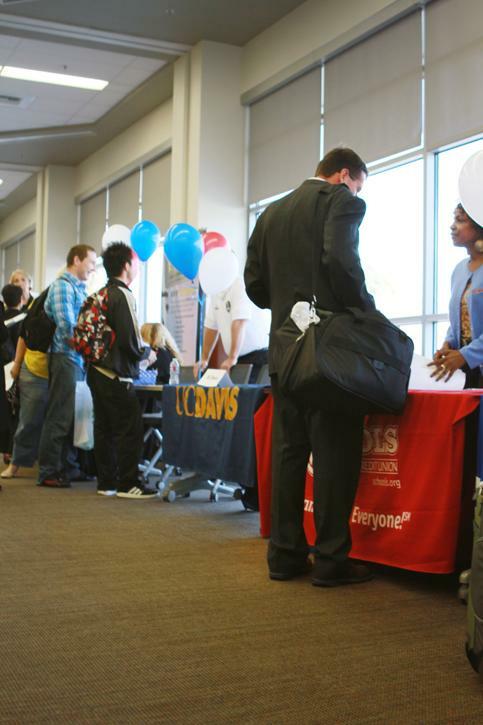 The Career Fair at American River College was incredibly busy Thursday, as 31 different businesses packed a room in the student center and offered information about jobs and career options for places like the California Highway Patrol, Devry University, and Farmer’s Insurance. Kolleen Ostgard, interim president of student services said she saw “anywhere from 500 to 600 students” pass through the room, picking up pamphlets and talking to employers. Stephanie Hall, a child development major, spent an hour and a half inside. She is a first semester student at ARC, and thought the event was very helpful. About half of the booths also offered information about opportunities for students while they went to school, like Sugar Bowl, the ski/snowboard resort, and University Enterprises, Inc., an organization with assistant positions for students throughout California. But the main focus was looking towards the future. Dante Loggins, a biomedical engineering major, was disappointed that the FBI could not attend as planned, due to the government shutdown. The career center at ARC also holds workshops on résumé development and interviews. Be the first to comment on "Students learn about employment opportunities at Career Fair"